In the digital world, achieving quality printing from inkjet cartridges and ink ribbons requires excellence in ink manufacturing to match the equipment’s exact standards. Image Specialists, Inc. has been trusted by manufacturers, recyclers and distributors worldwide to satisfy their highest requirements for over three decades. Whatever the need, Image Specialists will help you to identify and deliver solutions that can confer significant improvements in product quality and performance. Image Specialists lets you avoid the risk and expense of poor production or inferior quality so that you can operate with confidence and satisfaction. Aside from inkjet inks, their assurance of excellence embraces the production of a full spectrum of ribbon inks: computer record, matrix, OCR/bar code, fluorescent security, and many other specialty inks. A resource for current users and researchers to easily access information about current and new products, activities and events in which the organization is involved. A search tool to easily find the right product for the right customer. Image Specialist sought a cost-effective solution. They wanted a well-organized and visually interesting web site, showcasing their products. The right solution also needed to seamlessly integrate e-commerce and searching, while enabling their staff to easily maintain the database of products themselves. Pulse Solutions developed an intuitive and appealing web site. First, our information architects developed a site structure and layout to better organize information for users. Next, our design team combined Image Specialist’s longstanding brand with large, vibrant images, to retain brand-loyal members while attracting new members. Utilize a relational database management system in the form of SQL Server 2005 to save all of the site data realizing enormous potential both in terms of access speed and ease of management. We built a CRM solution for Image Specialists to be better prepared to work with International customers. 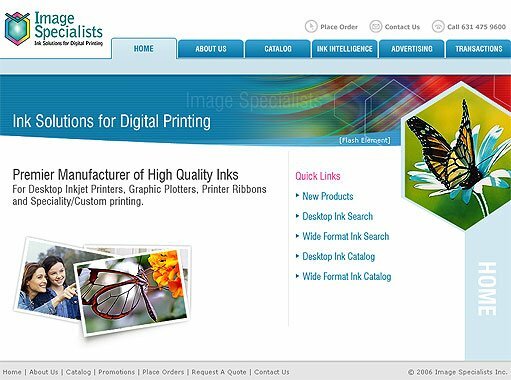 Image Specialists has varied products with multiple uses, each product can be used with multiple cartridges that belong to several manufacturers. A custom built product management system has helped them keep their customers updated on a weekly basis and allows their staff to make changes to their product database quickly and easily with minimal technical training. A newsletter system adds to the functionality that Image Specialists required for reaching thousands of companies that attend their trade shows. A custom order processing engine completes the circle. A powerful, attractive web site that is easy for both visitors and site administrators to use. Only a couple months after the site launch, online inquiries have nearly doubled and they have seen an increasing growth in their sales over the years. Not only has the website improved business the backend CRM system and Product Management tools have made the business processes a lot more effective and efficient. The order process is streamlined which means less time between receipt to delivery making customers happier than ever !